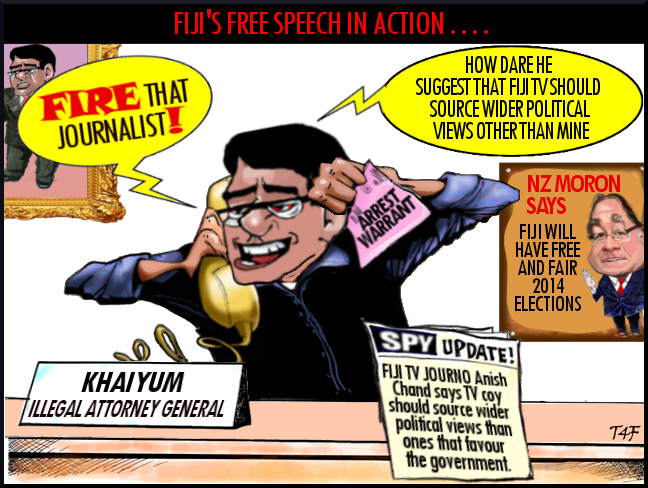 The media group Pacific Freedom Forum says a senior reporter at Fiji TV was sacked following a phone call from the attorney-general, Aiyaz Sayed Khaiyum. A journalist and publisher, Ricardo Morris, who is a former coordinator of PFF, says the veteran reporter Anish Chand had said at a meeting that the television company should source wider political views than ones that simply favour the government. Mr Chand declined to comment on the matter, but Mr Morris says one of Mr Chand's own colleagues [no doubt a sly khaiyum masi-polo] undoubtedly called the authorities and shortly afterwards Chand's contract was terminated on May the 3rd - World Press Freedom Day. This confirms yet again that Bainimarama has been lying all along about free speech and free media in Fiji. Bainimarama is clearly not the type of person to lead any country!